The CR6ZZ is a range of road legal radial competition tyres suitable for classic performance cars. 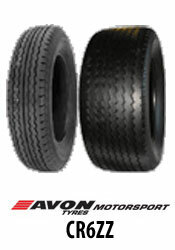 They are an all-weather tyre designed to be used for competition driving in disciplines such as classic road rallying, trackdays and circuit racing. Available in a wide range of high profile sizes appropriate for the period. A range covering everything from minis and MGBs to Austin Healey 3000 and Ford GT40s. Although the CR6ZZ uses competition compounds the aesthetics of the tyre are very much in keeping with the cars they are intended to fit. Confidence inspiring, wet weather performance. An appropriate level of dry grip for the period, to avoid overloading suspension components. List 1B permitted race tyre. Designed specifically to complement the chassis characteristics of classic and historic performance cars.